I saw this on Reddit and figured it cuts across our diverse community. Were I live and what rule I use to determine a proper tip is 15-20 % of total bill then I think about the service/food/drink were they good or great ? I also assess how much I asked of our/my server -- like how many times I requested things. What are your thoughts on tips ? This is a link on how to increase tipping. It may help if your in the service end of business. Edited by rgillis783, 05 October 2018 - 05:28 PM. I always tip at least 20 percent. Having worked as a waiter, I can tell you that most of the things that cause bad service are outside of the waiter's control. In the movie, Astros represents mr White . On another note TR, I didnt know you were Dutch. You should visit a tournament sometime . Is this a reaction to Fks, a self-analysis of your tipping or an impressionation of a happy bird? A joking reaction to Fks... 20%, I say. Yes here in the states many feel 15-20% is the norm. I along with Astros will share that I did my time in the service industry. The place I worked in late 70's 80's had on the check "please leave a 20% gratuity ". I am cheap and thought it was a bit high even though I worked there. After a while I realized we-wait staff had to pay bus boys/set up staff 25 cents per person that were served. The 20% dwindled quickly some nights. On the opposite end of the spectrum are many that worked in the industry and are doing very well in higher paying jobs. These folks are very generous with tips and tend to over compensate on the tip -- so there is balance in the system. I'm 18 Fairway Although it usually depends on what I get back in change, 15% is fair for what I usually request in services. Yes Fks I agree we all look at how much we are tasking/requesting from the servers and most of us have budgets.I had an uncle who owned a few est. back in the day. He was very demanding of staff no matter were he went. I can recall him ordering a matradee to post two severs at our table and to only serve our table. I was very uncomfortable with this but he got his request. As the night ended I mentioned this to a family member. They asked if I saw the bill ? Of course I had not-- I was cheap even then. My uncle gave each server 50 dollars to make up for lost tips from others they would have served. That was in addition too the 20% tip -oh ya I am sure he slipped the matradee a little something. This is not boasting about my uncle just an example of a hard working man who demanded a lot but always compensated/rewarded those who hustled/worked for him. (USA) I consider not just the level of the service but also how many total $ my bill was. Some restaurants could be $25 for a two-person meal, and others could be near $50. Usually, the wait staff works just as hard at both. 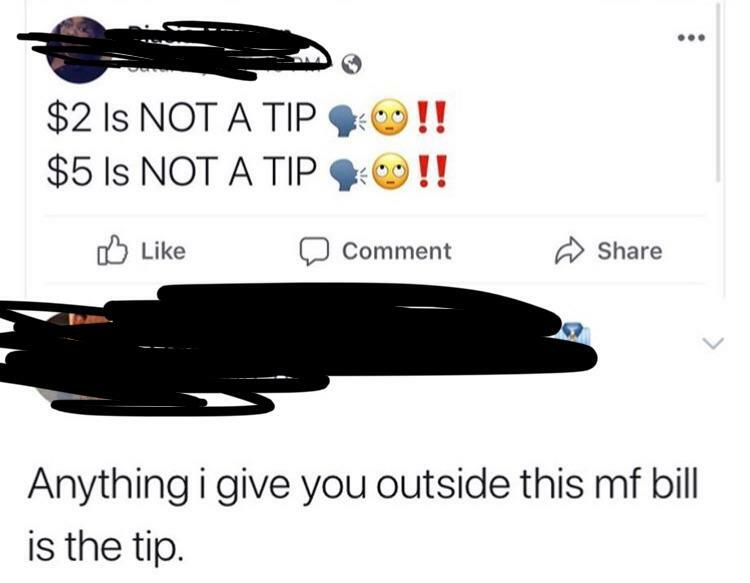 If I tip a flat 15-20%, then the wait staff at the more expensive place gets a higher tip simply because the food is pricier. Thus, I tend to tip 20-25% or more at a less expensive restaurant, 15-20% at a more expensive place, but I also consider the level of service. I try to give the server the benefit of the doubt if the service is poor (could be things beyond his/her control, could be having something bad happening in life that night, etc.) but I can recall at least once the server was so blatantly rude and miserable (we felt very unwelcome) that I gave a $0.01 tip, but that was an extreme case. I actually hate the tipping system. Sometimes I'd rather the menu prices just include the cost of the service. True for delivery, etc. too. I will admit, I have never worked a job that collects tips. Hello TR ya ranking up-- NICE ! Thanks for adding to this post. Choices at the truck stop hmm... I have a few wise guy remarks but I will spare you and others my low brow humor. Good for you for speaking up ! A company will only improve when told about their product. As a former industry worker I can tell you it is illegal for the Mgt. to try and get it from the waitress pay/tips. That said --it does not mean they did not try.